The Magnolia Society attracts magnoliaphiles from all walks of life and all parts of the world. This month, we catch up with Ethan Guthrie, the Greenhouse and Nursery Manager at Smithgall Woodland Garden in Gainsville, Georgia, which is a northern satellite garden of the Atlanta Botanical Gardens. Ethan served as the host for our 2014 annual meeting of the Society in Athens, Georgia. Q: What are your favorite types of magnolias? A: I like to think of myself as an equal opportunity Magnolia lover. I do have a particular fondness for all the big leaf species, Asian and American, but also really enjoy seeing all the hybrids bloom. ‘R20-1’ is one of my favorites. Recently I have been taken with all the Asian evergreen species which grow well in the Southeast, Magnolia kwangtungensis is definitely a favorite. Q: Tell us about your position at Smithgall Woodland Garden. A: I am the Greenhouse/Nursery Manager here at Smithgall Woodland Garden. I mostly propagate and grow plants that will be later planted here or at the Atlanta Botanical Garden. I also help manage the four major plant collections here at Smithgall which include Acer, Hamamelis, Hydrangea and Magnolia. One of my main focuses with magnolias is trying to get them to survive on their own roots. Q: How do you approach propagating magnolias at Smithgall? 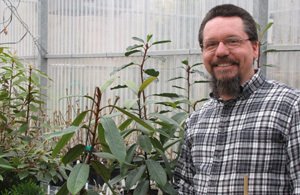 A: Mostly I have been rooting magnolias using high concentrations of K-IBA, mainly 50,000 ppm. This was a tip given to me by Oren McBee when I started this job. It has proven successful on everything from deciduous species to complex hybrids, and some of the evergreen Asian species. Along with cuttings we grow many magnolias from seed. Most of the seed is from wild collections from China and Northern Vietnam. I have also been learning to graft with the help of Jack Johnston. Q: What hybrid crosses are you currently trialing? A : Right now we are growing many of the newer Dennis Ledvina crosses. These include crosses with ‘Genie’, ‘Yellow Bird’, ‘Rose Marie’, ‘Gold Cup’ and ‘Black Tulip’. We are also growing some Kevin Parris hybrids, including Magnolia foveolata x M. laevifolia and M. grandiflora Baby Grand® x ‘Kay Parris’, as well as, M. changhungtana x M. insignis. I have also tried my own crosses which include M. insignis x M. sapaensis; M. sapaensis x M. conifera var. chingii and M. foveolata x M. figo var. crassipes. Q: Tell us about the magnolia collection you are building at Smithgall. A: Our collection here at Smithgall consists of deciduous and evergreen species as well as hybrids. We are looking at hardiness, landscape value and propagation techniques for both groups. Right now we have between 150-200 taxa in our collection. Q: How did you originally get interested in magnolias? A: I have certainly always admired magnolias, but it wasn’t until I came to this job that I really came to love them. I basically walked in the door and inherited quite a nice magnolia collection. After the first couple of seasons working here with them and watching them bloom I was hooked. I think I can honestly say I have never been so captivated and completely immersed in a group of plants than I am with magnolias.